During my morning beautification rituals music, of course, must be present. My latest go to has been Pandora’s “Alternative Endurance”. 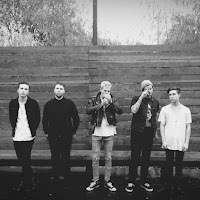 It shares a variety of Florence and The Machine, Shiny Toy Guns, Calvin Harris, Yeah Yeah Yeahs, and this morning, much to grandest surprise, - THE NEIGHBOURHOOD! As I was applying my third layer of mascara I hear a familiar beat and marveled at the similarity to The Neighbourhood’s “Sweater Weather”. Of course, as the track continued to play it really was The Neighbourhood on Pandora! One of the biggest thrills of writing and sharing new and upcoming bands is the hopes that the masses find them as intriguing as the folk over at Bite Me! Music and Fashion. So we have for you today, if you haven’t caught on just yet, a group of talented and art conscientious men who are dead set in making themselves known to the world and are having that success. Thanks to Pandora for furthering their success.